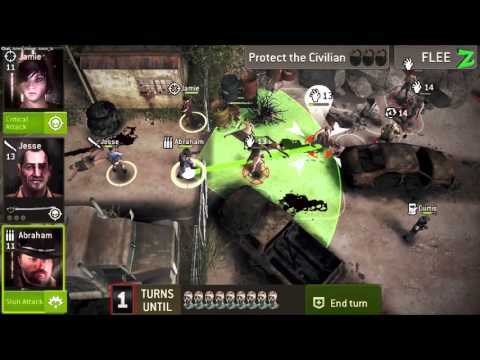 Episode 11 Strategy Guides - radios up for grabs! Already beaten Episode 11? 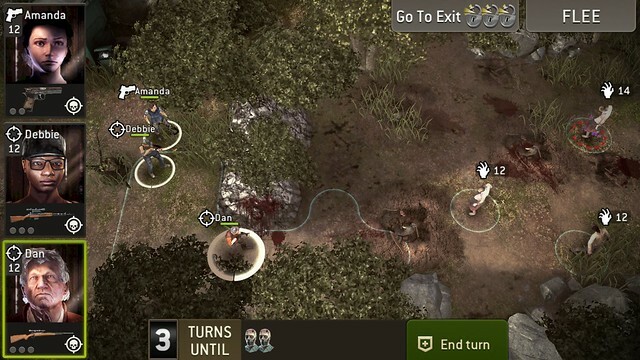 Help out your fellow survivors by posting your best strategy guide for each mission in the episode. Get your strategy guide in before Wednesday, 16th December at midnight UTC. We'll choose the best ones from the bunch and give full XP and Supplies to our top 3 favourites. Our absolute favourite will get an extra 20 radios. So what are you waiting for? Post up your strategy guide. A worthwhile reward? 20 radios is pretty much the equivalent of offering us ~40k xp.. With a tiiiiiiiiiiny chance of actually getting something worth keeping. 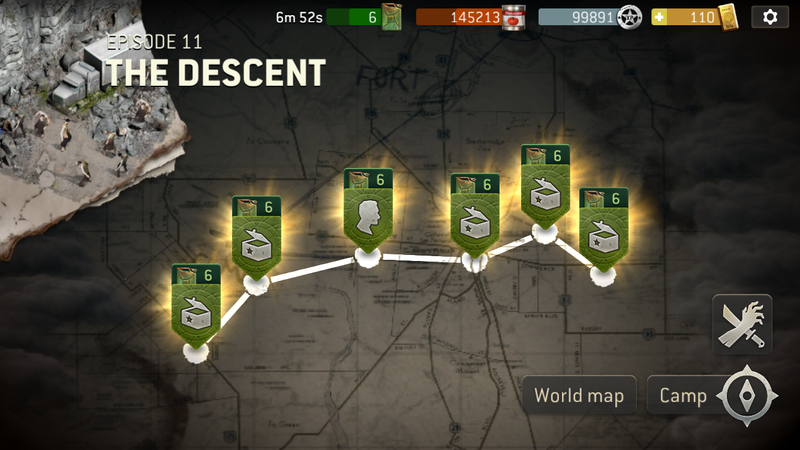 Pretty much all my decent survivors were pre-radiotower, after that piece of crap was released, everyone seems to need atleast 100 radios just to score an Epic with maxlvl 13.. So no, i wont bother with your competitions as long as the rewards are junk. Im pretty sure you will manage to get some decent entries anyway though, i just think its a PITY they arent rewarded properly - cause some of the ppl on the forums are really helpful and would have deserved better. Now to stay on topic... 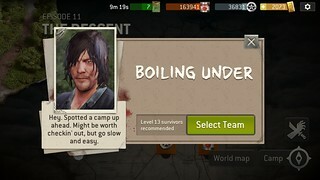 I finished it the first day it came out =S I will have to try to do lvl 12 survivors vs lvl 16 walkers!! IF I end up being able to finish any one of them, I will post up my strategy =D Ty for giving us this opportunity! 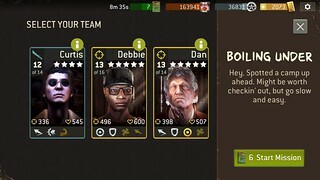 I've tried it with lvl 12 survivors. The body shots make it impossible for me to get through before getting swarmed ='C I'm fresh out! havent done this episode yet.. only got level 9 and 10 survivors.. 1 survivor at level 11. so still need to level up before trying this episode. and i only got hunter at max level 9.. so cant do that right now. i need radios! @TK-421 the end date is wrong (december 10). Whats the right date? Oops! 16th December is the end date. This is another map where standing your ground and fighting instead of moving forward as fast as possible is detrimental to your success. 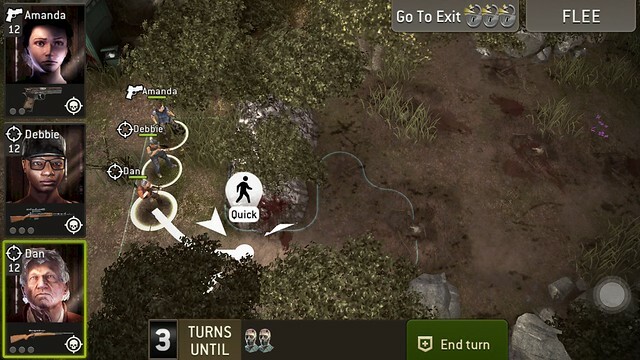 The number and placement of the zombie mines forces you to pick your way very carefully across the map by utilizing your single move AP. It also seems like the level of zombies on this map is higher than the rest, with several 15's spawning whereas the others were mostly 12's and 13's. Do. Not. Stop. Move then shoot, move then shoot. Often you will be forced to do a single AP move in order to avoid a mine. AOE is very important on this map due to the sheer number of zombies. This map is much, MUCH less stressful than the first. Not only is the zombie level lower, there's a lot more room to work with and a lot fewer zombies and zombie mines. Take your time, avoid the mines, and take a shooter + hunter for those tank zombies. I didn't pay attention the first time through and missed the instructions. You have to step on the mines to get the warrior to come out. You do not need to kill all of the mine zombies to get the warrior to come out, just release them. 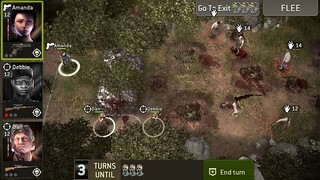 Try to get teh first two zombie mines(regular zombies) on the first turn if possible. This will only be possible if zombies spawn close enough to attack and step on the mines. Clear the tank zombies first, and do it ASAP so you don't have to worry about stuns later on! Finally, release the hunter by stepping on the mines ASAP to get the third attack per turn. This will make you life a LOT easier. Suggested group: Hunter and Warrior. First, Assault + Hunter is an absolute MUST for this map. A Warrior for melee AOE is also very, very useful. Curtis has a TON of HP, and is a bruiser so he can stun. Leverage the fact that he can take a few hits and hold his own. Fire away, and use your warrior to protect your assault and hunter. Use the Assault to open the gate. During the six turn wait, one zombie spawn will occur, and one tank will spawn on your side of the gate. Make sure your hunter and warrior are prepared with either a dual attack charge up or a crit hit charge up to take them out easily. Once the gate is open, this map turns into a rush to the exit. It IS possible to simply kill away(as I did in my video) but the goal isn't to kill everything, it's to get out alive. You can run along the bottom portion of the map to escape easily. Otherwise, just AOE everything to death and let Curtis take care of himself. LOTS of armor on this map. Take at least one Warrior. Two would be better. Or one Warrior and one Scout. Don't take an Assault on this map like I did. I beat it on my first try, or I would have come back with a more melee focused group. Hunters really are indispensable on most maps. Clear the area, then use the hunter to open the gate and let some zombies out. Immediately close the gate next turn! Clear the area again, then re-open the gate and go get the Tough Walker with your charge abilities. The exit is right there, so you can do it and get out without worrying much about the zombie pile. The map is called "The Flood" for a reason. AOE is an absolute requirement for this map, so take a Hunter, Warrior, and Assault. Beat it on the first try, though. My favorite group was the best possible makeup! Opening the doors on this map causes zombies to come from the top middle, NOT by the door. So get them open ASAP. 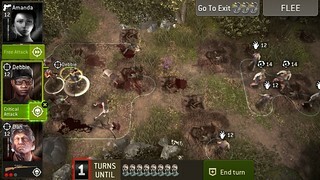 Use your Assault to open the left door with the warrior protecting him, then have the Assault help Curtis take care of the zombies coming from the top middle. Control the right side with your hunter. Follow up by having the Hunter and Warrior open the two remaining doors. Assault stun is REALLY key here to buy your guys some time. Once the doors are open, book it ASAP! As Rick would put it "We didn't want to waste the bullets". You don't need fancy firepower in 'The Descent'. Two bruisers and one warrior is good enough and I'm upping the ante by doing it in *Hard Mode*. Start and move in bruiser-warrior-bruiser formation. 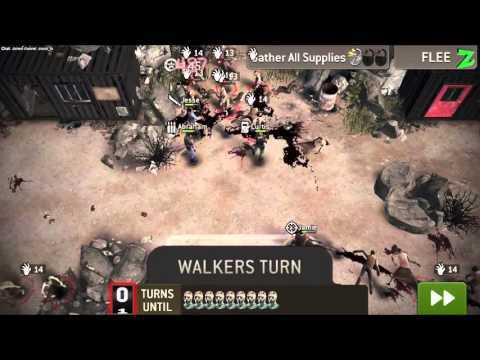 Make sure they are doing oversight when walkers are within attacking range. 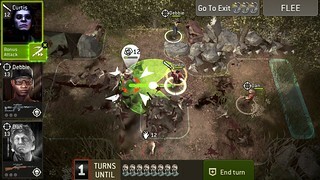 Avoid big traps at all costs and activate small ones when no other walkers are in range. Charge up your warrior for the additional attack by occasionally breaking formation for the kill. The bruisers can take care of themselves by stunning walkers of any level. The objective is to run to the exit, i repeat, RUN! Yes, i know there are 2 fat walkers that will probably take you 4-5 shots each to kill.. The main reason why guns are not recommended - you will have a dozen level 18 walkers crawling over you in no time if you are insist on getting rid of those fatties. If the fatties are at the top - go through the bottom, and vice versa. Unless you are as unlucky as i am, I had one at each side, so i had to engage one and once there is an opening, I dashed to the exit and cleared the stage! The charged up skills nicely boost my chances by mass blocking or allowing warrior to move extended distances. Disclaimer: My bruiser has a 100% interrupt weapon - crucial in engaging the fat walker by disabling them in oversight. 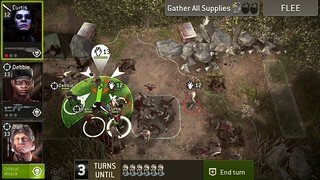 4) Save the double shot of the pistol for the armored walkers (you will need it) Same for the riflemen with their ability. I've been checking some of the videos episode 11 mission 1. This one is a tough one for me. I was using 2 hunters level 11 & 12. One legendary 12 shooter. I haven't made it yet. Trying hard to avoid stepping on the walker mines. 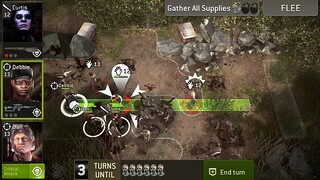 Those level 15 fatty walkers seem to be my demise! I guess it was Zoson's video that makes it look smooth. This one is frustrating to me! My warrior & assault guys are'nt strong enough yet. I'll keep tryin, but seems like I keep dying! ARRRRGH !!!!! Not sure what u mean? i think he means, if he knew this thread before he completes episode 11, he might have recorded it. i think..
Because of past threads identical to this one I decided to record all new content. A little foresight goes a long way! These guys should be reposted on the Wiki. Hey, here is my strategy guide. Sorry for my english, its not my first language and that i dont have more pictures. Target: Get to the exit. Situation: First one is very hard. 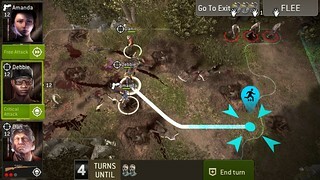 It is an open field with a lot of mines and walkers (w.). 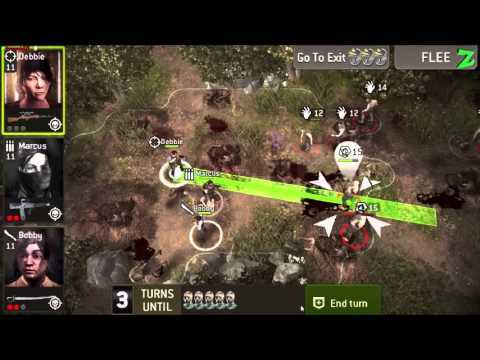 So remember: As on all maps with traps – plan your steps! Two heavy w. and a lot of normal ones between level 12 and 15 are waiting for you. Try to get a good range for your hunters to deal a lot of damage to the w.. Dont let them come to close. 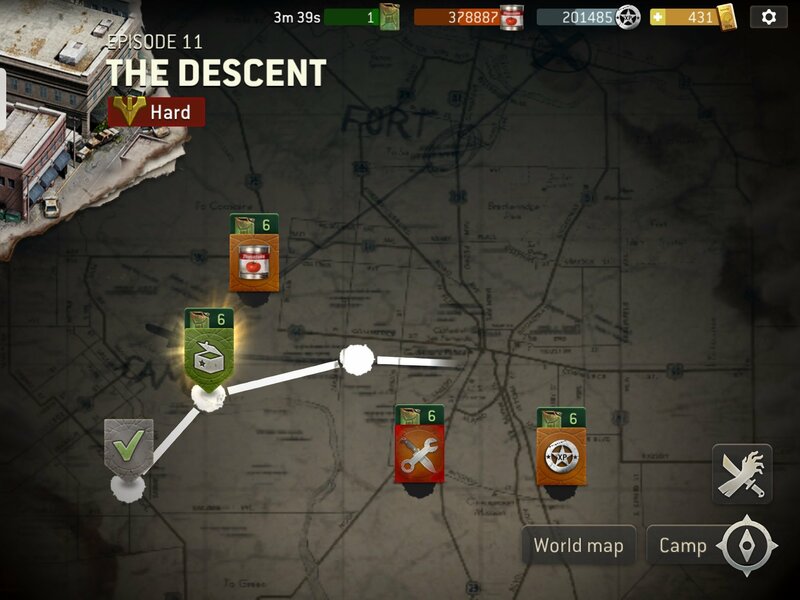 Get one hunter to the top of the map and call the w. with the other two survivors at the bottom of the map. Move slowly backwards and deal damage with the hunter(s) to the heavy w.. As soon as they are dead, get to the exit. You can also try to run but you need to be lucky to get through the walkers. If a heavy one graps you, you'r dead. Target: Gather all supplies (3, all at the top of the map) and get to the exit. Situation: A less stressful map with some lover level w. than on the map before. But sill no easy - because of the mines (you should not tap on to). There are also two heavy w., so you need a scout or a warrior. Again look out for the mines and the heavy walkers, plan your steps, no need to rush. At the end of the map there is a zombie pile, which drops a normal level 13 w. each round and every second or third round also a heavy w. (at least that’s what I got, but I’m not sure 100%)! Best tactic is to get one survivor to the top to open the boxes. Take a hunter, he can support your team from there. 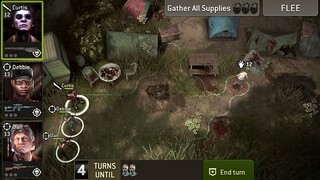 With the other two survivors take down all upcoming wlkers. Be careful especially at the end, at the last box. It’s a corner where you can end up in a trap very easily. Make sure you can support your hunter while he is getting to the box. Use a shooter to kill the fat walkers. Dont take to much time, otherwise the zombies-waves are going to crash you. Target: Clear the traps, free the warrior Jesse and get to the exit. Situation: First, you can just bring two survivors into the map. There are five traps you need to clear to finish the map. And again: as on all maps with traps – plan your steps! Good to know: Jesse is a level 13 warrior you can control from the moment on you “opened” all five traps. •	First trap: 2 level 13 normal w.
•	Second trap: 1 level 13 heavy w.
•	Third trap: 1 level 13 heavy w.
•	Fourth trap: 1 level 13 normal w.
•	Fifth trap: 1 level 13 normal w.
Open the traps step by step. Be careful with the heavy walkers. 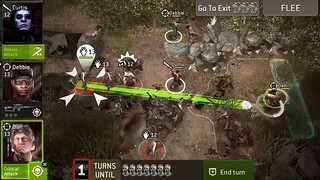 Try to get some more walkers in one line for the hunter to take down more with one shot. Situation: You spawn on the other side of a fence, so you NEED and assault and a hunter. You'r on the left side, Curtis is on the right side. Last survivor should be a warrior. You can take Jesse from the last mission if you don’t have a better warrior. Curtis needs 6 rounds to open the door. Protect him by shooting through the fence. Caution: there are spawning some walkers on your side of the fence. 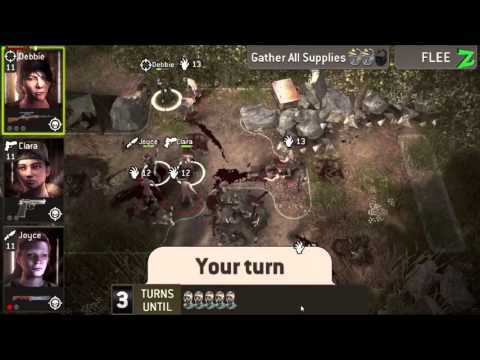 When Curtis is down to three rounds before the fence is open, there are two normal level 14 walker spawning, next round it will be a heavy level 14 w.. Take them out immediately. After he opened the door, you need to follow Curtis and get to the exit. 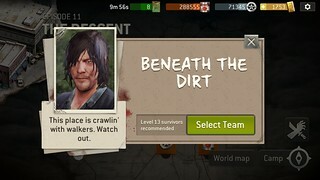 Therefore you need to kill some more walkers coming from the right side of the map, where the exit is. Fight yourself through them (take the way at the bottom of the map, not at the top) and thats it. 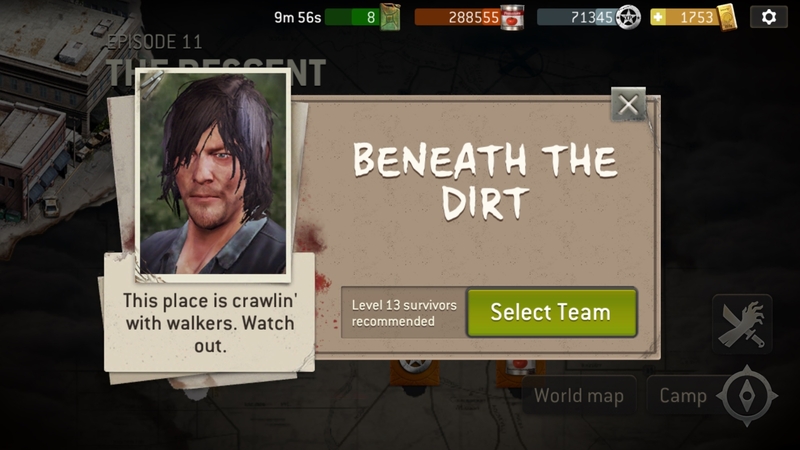 Situation: At the beginning there are 3 or 4 normal walkers level 13 and 14. First, take them out. There is also no zombie-wave spawning after some rounds, so no need to take care about this. 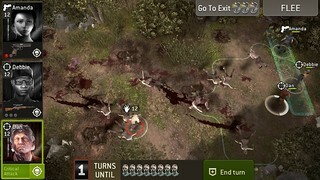 But there is a zombie pile at the bottom of the map, which is giving you one normal level 13 or 14 walker each round. First, kill all 4 w. on the map. 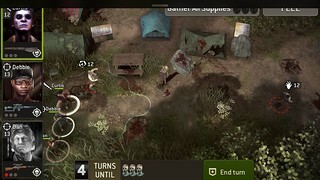 After all is clear, use a survivor to open the gate and CLOSE it next round immediately. Otherwise all 9 to 11 ! (one level 17!) tough walkers will come out. Kill all tough walkers and open the door again for the second wave. After you have killed them, you need to get to the exit at the bottom of the map. Target: Gather all supplies (3) and get to the exit. Situation: This mission is a really flood of zombies. Massive amount of walker (normal and heavy ones) coming from the top of the map. There are 3 doors to open (the three supplies). Again, Curtis from fourth mission is with you, supporting you. Hurry up and open the doors (one on the left, two on the right side.) There are also 4 to 5 w. on both sides you need to kill before you can open the doors. Start with the one on the left, then rush over to the right side. You need to support Curtis in the middle, f.e. with an assault to stun the walkers. Its tough but possible, watch out and deal long range damage with your hunter to multiple target. Thank You ! I'll see what happens. Will let u know how it goes. ( your English is great ! ) I'm from Texas, so I've been told my English is funny too! LOL !! Unfortunately, I cannot get the iOS recording working in my network, so I will have to get by without video. I should have taken the clues like @zoson did that this is not the first time to request a walkthru for missions/episodes. Nevertheless, I hope this can help someone out there. I walked clockwise, cleaning the way to the switch. Once no walker was in reach, I had one survivor open the doors. This will let you see a bunch of guards in the building, some spill out, some will stay inside. I would recommend closing the door as as possible, a 2-action survivor like a Shooter or Warrior would help opening and closing the doors in one turn. I kept my team together at the top near the switch, with some side steps into the building as I took down the guards near the end. I kept opening and closing the doors, staying away from the re-spawning burning walkers and taking out as many guards as I can per round. There is one guard lvl 17 that needs quite a bit of firepower to take down. Be careful, as the tough guy seems to hide next to a door and might jump you when you move in. Since there is no 'normal' spawning of walkers you could attract, I would recommend going slow and keep the walkers at a distance. In hindsight I would recommend a Shooter and/or Scout with heavy single-target damage, I suffered a bit since neither the Warrior nor the Assault was able to take down one, let alone multiple Guards in one attempt. I started focusing on the left side, getting one guy as soon as possible to the door on the top left. I left the walkers on the right side completely alone, just kept out of reach. I used the Assault guy to support Curtis, but always kept behind him, since my guys are not anywhere near his health. Moving the entire team fast from left to the right side, keeping the Assault with Curtis. As soon as possible I had one guy jump forward to open the top right door, then the last one on the far right. I was able to ignore the walkers spawning from the left side as they need 2 turns to get me in trouble even in the middle. This allowed me to focus on putting the walkers on the right out of their misery. I would say one has to move fairly quickly in this scenario, as constant spawning from left, right and top will flood the place. Opening the doors has total priority even if you get a scratch or two in the process. Be careful as you open the third door, as Curtis will just jump and run, leaving you with the hordes to clear your path back to the exit! I stayed close to the exit and somewhat close to the third door, limiting my exposure. I would definitely recommend using an Assault with the massive stun attack. Other than that 2 Hunters, or Shooter/Hunter should also work. 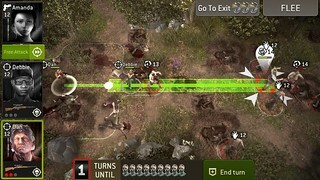 It would help if you have survivors that can take down multiple walkers lvl 13-14 in one shot. I will reference this when I get that far. Still got to get past 11, 1. Do you have tips for that one? Unfortunately, I did not prepare for that, sorry. As you are encouraging me so nicely, I will prepare more walkthroughs going forward. Hi my name is KaLi and I'm going to take you through my walking dead experience and guide you through your missions in episode 11. I haven't tried lately. Just frustrated with the stupid walkers that pop up, especially the level 15 fatty guys! 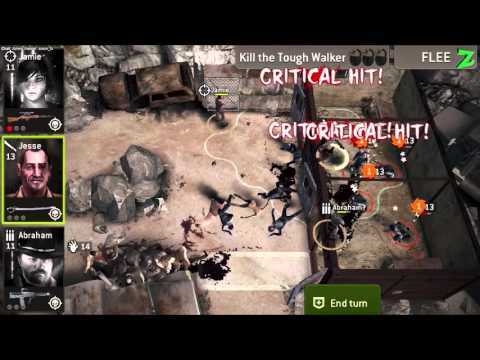 Hello survivors, my name is Kali from RickRollers and I will be sharing a piece of my Walking Dead journey and help guide you through your missions in episode 11. First of all you will need a great team to tackle whats ahead. I love having an all range team when I go into the unknown because at least I can try to clear them off from the distance. 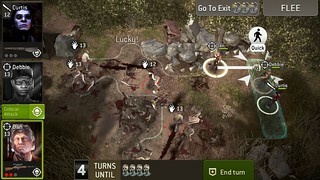 When you first enter the map, you will not be able to see walkers until you step forward. 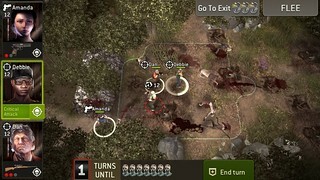 Use one of your survivors to do a quick step forward to reveal walkers ahead. 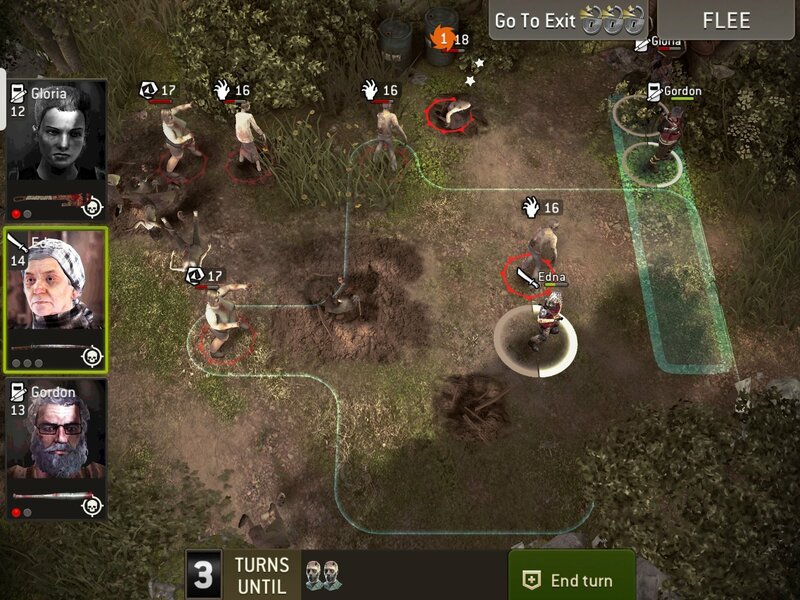 As you can see, now you can see walkers in range which makes your range team great to take them off from a distance. 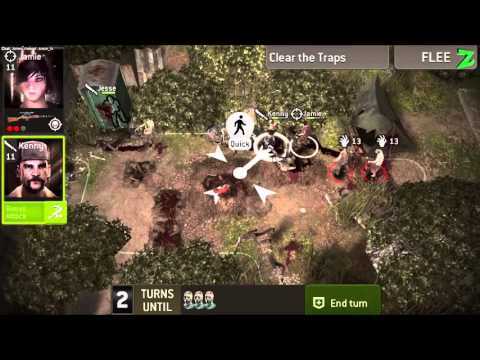 After taking care of the first wave of zombies, you will have to proceed forward through and around the traps. 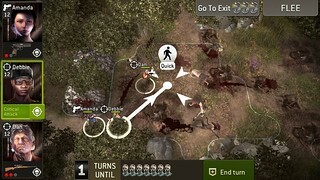 The best approach is to try to use quick step actions so you can have more accurate movement with your survivors to avoid stepping through traps. However if you want to tackle what's underneath, then go through one of the trap like me and there comes out the Big Walker! 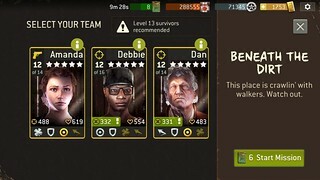 Keeping your team close and unleashing all three survivors attack during one turn can help you eliminate this guy without much threat. Warriors are also great for this map to take close combat against these guys. 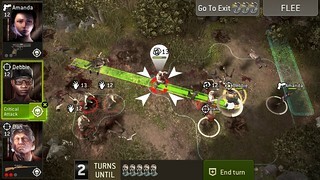 As you proceed cautiously through the map, you will notice a spawn that unleashes both big Walkers and regular walkers. You would want to try and save your charge attacks to tackle these Big Walkers. My hunters and shooters was able to clear them off from a distance. 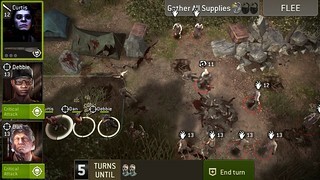 You may also have to watch out for the walkers wave re spawn so backing your survivors can be a good strategy not to get stun by the big walkers. After getting rid of them you will want to try to proceed forward into the end point. Watch out though because there could be surprises towards the end. As you can see I was ambush by big walkers from the ground traps, so you would want to have some charged up ability to clear these guys. Warriors or Scouts would be great to take them down, however I didn't have any problems with my Range Team. Finally made it until the endpoint with all survivors still alive and ready to tackle the next mission! During this journey, I brought a Warrior with me to add in some Melee Combat. 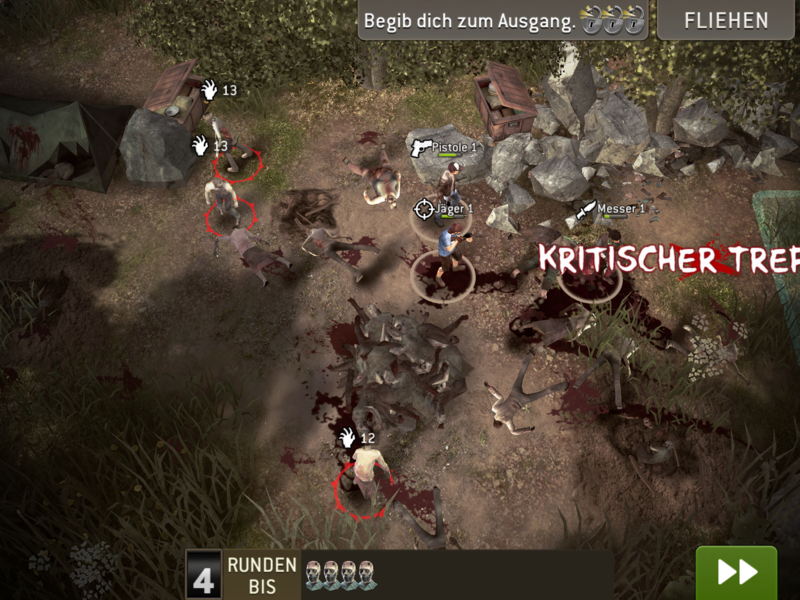 As you enter the map take care of the walker you see from a distance with one of your range survivors.. Proceed through the map and avoid the Traps by going around it, or else a Big Walker will come out like below! Take care of that guy! and have your survivor collect the first crate of supplies. 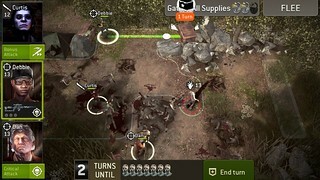 You will also notice a pile of corpse with zombies respawn of both regular and big walkers so having your range team can help you clear them off from a distance. As you have taken these steps forward, your next zombie wave should be coming soon so be prepared like me in the picture below and stay back until they show up. Hunters are great for this situation to take multiple walkers from a distance. 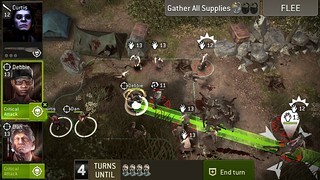 In my next turn, since I have both my hunter critical charge, I went forward and cleared the big walkers and also align some of my shots to also clear multiple walkers at once. After clearing these walkers, its time to collect the remaining supplies. 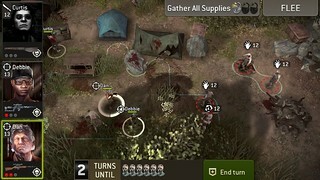 I was able to use one survivor to get both of the supplies crate while preparing my other survivors to proceed ahead. As you proceed, be careful of the corpse respawn because big walkers can come out! Don't fear them though, and use your Hunter charge abilities to critical damage and clear these walkers. 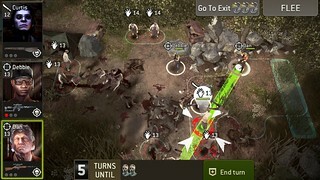 Another respawn wave should be coming soon around this time so try to get your hunter in position and range to take care of at least two or more walkers. Once your path is clear and you have collected all your supplies, make your way to the endpoint and prepare for your next mission!